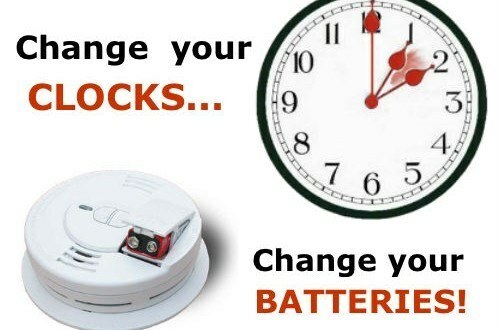 Replace smoke alarm batteries when you set your clock forward for Daylight Saving Time. It’s time to turn the clocks ahead and lose an hour of sleep this weekend when Daylight Saving Time kicks in at 2 a.m. on Sunday, March 12. The Albuquerque Fire Department reminds everyone to replace the batteries in their smoke alarms as they turn their clocks forward an hour. This weekend is also a good time for everyone to take these steps to make sure their household is prepared for emergencies. When turning the clocks ahead, take a few minutes to replace the smoke alarm batteries if needed and push the test button to make sure the alarms are working. It’s also a great time to check carbon monoxide detectors. If you don’t have smoke alarms, install them. At a minimum, put one on every level of the home, inside bedrooms and outside sleeping areas. Check local building codes for additional requirements. Make sure everyone in the household knows how to get out of every room and how to get out of the home in less than two minutes. For more information and additional fire prevention tips, visit the Albuquerque Police Department website.